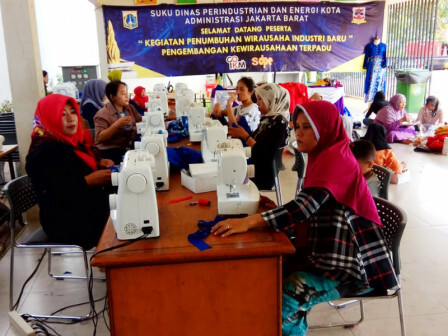 To create skilled citizens, a fashion design training was given to tens of people at the Kalijodo child-friendly integrated public space (RPTRA), Thursday (3/28).
" That's my dream, hopefully it can come true"
Farda Amelia (20), one of participants who is a college student from one of private universities in Pamulang admitted that she participated in the training to realize her dream as a successful fashion entrepreneur. "That's my dream, hopefully it can come true," she expressed. She determines to continue to follow all activities of the integrated entrepreneurship development (PKT) program, from creating products to promoting them. Similar statement also came out from Yuliana (40), a housewife living in Tambora Sub-district. She wants to have sewing skills and open a fashion business. "I will continue to hone my skills and open a fashion business," he said.